Here’s the find I pulled out of the attic of my grandparents’ house yesterday. It’s an L.C. Smith model No.3, and it’s in half-decent shape. I haven’t had a chance yet to check it over for manufacturing dates or anything like that, as there’s a layer of grime that has to come off first. I have a feeling that I’ll be visiting this website a fair bit in the next little while. From a quick survey around the Internet, I’m guessing it was manufactured between 1900-1910, but I’m not sure at this point. The L.C. 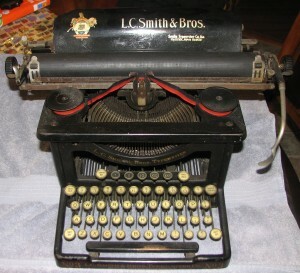 Smith company later merged to become the “Smith” in Smith-Corona. All the keys are intact, and as you can see, the ribbon is still strangely bright. The platen is somewhat dried out and cracked, but it might soften up with some care and judiciously-applied products. Mechanically, all the keys strike, but the carriage doesn’t advance. I don’t know if I can fix that or not. My goal is actually just to clean it up as much as possible, not to actually use it for typing, so that’s not a big issue. Some of the lacquer is not in great shape, which I understand is difficult to fix, but we’ll see what happens. It obviously saw a good deal of use in its day, as the paint is visibly worn on the spacebar where the right thumb would strike. 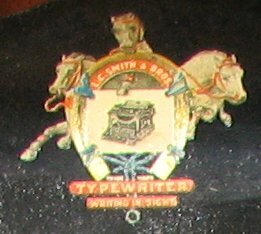 The three-horse Smith decal is in excellent shape, with the motto “Writing in Sight” clearly readable. This motto refers to the “visible” style of early 20th century machines~as you can see from the picture, the body of the machine is open and you can see all the working parts inside. I’ll post more pics of the cleanup process as it goes along. I expect it will take a lot of patience, but I’m excited to get started!